Every so often, a cookie recipe comes along that you just know is going to be a keeper and I was right with this peanut butter cookie. The problem with recipes I have attempted in the past, is that they are too hard or lack sweetness. This cookie stays soft and has just the right amount of sweetness for me. Although you can make them with Milk Chocolate M&M’s, I always make them using Peanut M&M’s or, my favorite, Peanut Butter M&M’s. 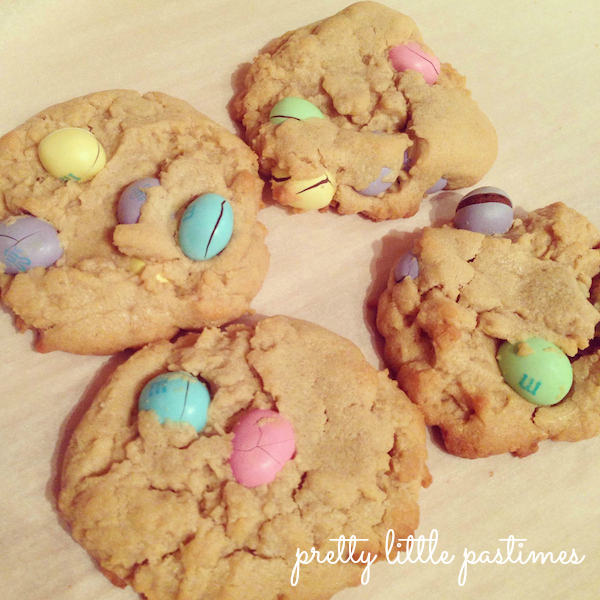 With the Peanut Butter M&M’s you get a double peanut butter cookie that is hard to resist! I made these over my Easter weekend with pastel colored Peanut Butter M&M’s eggs for a little holiday flare. In a large mixing bowl cream the butter and sugars on medium speed. Mix in the peanut butter, egg and vanilla, one at a time, until combined. Slowly mix in the baking soda and flour; be careful not to overmix. Gently fold the M&M’s into the dough. Place the finished cookie dough in the refrigerator to chill for 30 minutes. Preheat oven to 350 degrees. Drop the dough by the tablespoonful onto an ungreased cookie sheet (I always cover my cookie sheet with parchment paper for easy cleanup). Press the dough slightly since they do not spread much while baking. Bake for 8-9 minutes until just the edges are beginning to turn golden but the cookies is still soft. Remove from oven and allow to cool/harden on a wire rack. I will definitely be adding these to my Christmas Cookie baking list. With red and green M&M’s, they will make a great care package for my mom who can resist all sweets except a good peanut butter cookie! Like mother, like daughter. Enjoy! so cute and look delish! Thank you so much! They are one of my favorites!